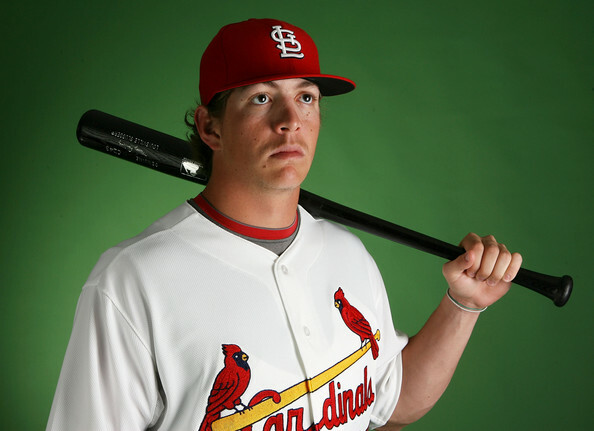 Okay, so we’ve all heard just about enough about Colby Rasmus, his dad, and his future with (or without) the Cardinals. But just as it is with other proverbial train wrecks, we somehow can’t stop watching, assuming, and predicting. Tony Rasmus says Colby’s even-keeled personality isn’t always understood, but it doesn’t mean he doesn’t care. As the latest drama swirled around Colby’s dad, Tony, some of us started to buy into reports that it was Daddy Rasmus who was rooting around and harming Colby’s career — in St. Louis or otherwise. From chatter on message boards, to opinions about Colby’s potential, and rumored outside coaching sessions, an image was painted of Tony the overbearing sideline parent. Meanwhile, Colby’s own image was shadowed enough that it seemed he disappeared from the situation altogether, except for being called lazy and even disrespectful for the lack of comment. I must confess, I bought in. I was ready to propose a restraining order to keep the elder Rasmus away from his Cardinal son in order to either force or allow Colby to call his own shots, maybe for the first time. I believe in a certain amount of the hype surrounding our young center fielder. I think a Colby Rasmus at full potential is the kind of player you’d be crazy to get rid of this early. And a faltering fandom of manager Tony La Russa had me leaning more in Rasmus’s favor. Then, after I called for Tony Rasmus’s “expedited” exit from Cardinal Nation, I was directed to an article and radio interview on the Bernie Miklasz Show with Tony. Trust me, I was jaded, fully prepared to stand my ground. But I listened. And folded, like a deck of cards. Here spoke a father, confused by the drama and hopeful for his son, not as the “puppet master” I thought I’d hear. Tony claims in the interview that he’s only spoken to Colby about baseball four times since February. And three of those four? He was chiding his son on the very thing we’ve all spoken out on. It’s no secret that Tony seemed to have dug himself a hole via internet message boards, talking about his son’s lack of future in St. Louis and the like. The ideas and frustrations he seemed to spew only hurt public opinion of his son. Could it be that he is simply naive about the reach of his online words? He thinks so. Clearly, it is important. And his loose-lipped web presence was unwise. However, it does remove a little of the scum-factor we were starting to believe he had. As for the presumed coaching Colby was receiving from dad? Not so. According to Tony, Colby is getting extra help. But not from Dad. And, he added, it seems to be in an attempt to work on things the Cardinals coaches have pointed out. So, if Tony Rasmus is a problem in perception only, a large portion of responsibility has one place left to fall — squarely on the Colbster’s shoulders. I know, I know, we all want to say it’s the tension between Colby and TLR. I did too. But if Colby does, as Tony Rasmus said, love being in St. Louis, that must not be it. If Colby was the “toughest player mentally” Tony Rasmus ever coached, it can’t be that he’s too sensitive to handle the harsh criticism or his dad’s out-of-context claims about his future. If Colby isn’t willing to take the little advice his dad has offered and assure his fellow outfielders that “If I can get to it, I’m going to get it,” he deserves the criticism for his lackadaisical defense. And if Dad is right and the ruckus leading to the disputed trade request was because “A large majority of that stuff, I guarantee, is Colby’s fault,” we can’t be too quick to say it’s the inept coaching staff that is ruining Colby. I’m not convinced Tony La Russa is the perfect manager for Colby. Neither am I convinced that Tony Rasmus is entirely blameless. But as we peel the layers back on this complicated saga, I’m more convinced that the drama is unnecessary. Maybe, Colby’s just a 24-year-old kid who’s still learning how to be a big leaguer. I know that everyone’s personality is different, but I still would like to hear what Colby himself has to say. He’s been one of (if not the) hottest topic among Cards fans and in the Cards media and blogsphere, yet we haven’t heard from him. Maybe we don’t have to — there’s no requirement for that anywhere — but it would be good to hear his perspective. I completely agree with that. I may have a different opinion about his dad, but I still want to hear Colby speak out for himself. Think he’d talk to me?! Lol.